American University, like all accredited institutions, expects all faculty teaching in an online or hybrid classroom for the first time to complete the requisite training. 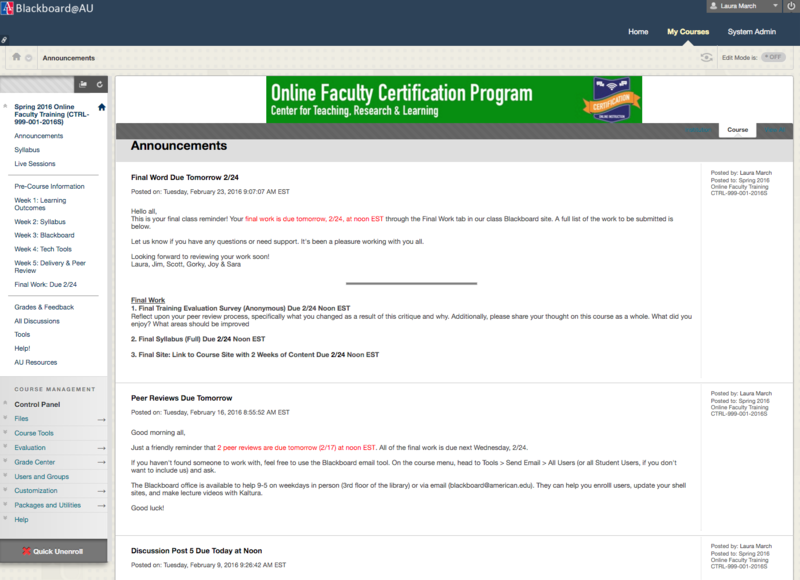 I created (and now manage and facilitate) courses that focus on teaching instructors pedagogy, syllabi, course design, and effective use of educational technology. The purpose of this class is to prepare instructors to teach in hybrid or fully online formats, as these are often very different venues for instruction compared to traditional face-to-face classes. It is also an opportunity to cover best teaching practices and a means to gain feedback on course content in a friendly and supportive environment. By the end of the course, instructors have a fully developed online/hybrid syllabus and two weeks of course content within a Blackboard test space. I believe that adults learn best when participating in active (participation-driven) and authentic (real-world relevant) learning environments. Much of this course also involves peer-review and formative evaluation – strategies that encourage higher-level thinking skills. Coursework is guided by ADDIE, an instructional systems framework used to develop effective curriculum. Each week focuses on one aspect of the framework (Analysis, Design, Development, Implementation, and Evaluation).